How To Build a Children's Picnic Table | KaBOOM! Take the  2x6x8' board. Cut  48" pieces from it. Take  of the 2x4x8' boards. Cut  48" pieces from each, for a total of  2x4x48" pieces. Take  of the remaining 2x4x8' boards. Cut  40 ½" pieces from it. Take  of the remaining 2x4x8' boards. Cut  25 ⅝" piece,  21 ½" pieces, and  19 ½" piece from it. Take  of the remaining 2x4x8' boards. Cut  25 ⅝" pieces from it. Take the remaining  2x4x8' board. Cut  48" piece and  17 ¾" pieces from it. Take the  2x4x40 ½" pieces that were cut in Prep Step 4. Measure down 1" from the top corner and 2" in from the bottom corner. Join the two spots with a line and cut a 38° angle on that line. Repeat on the other side to create a 2x4x40 ¼" trapezoid. Repeat on the other 2x4x40 ¼" piece. Take the  2x4x21 ½" pieces cut in Prep Step 5. Measure down 1" from the top corner and 2" in from the bottom corner. Join the two spots with a line and cut a 38° angle on that line. 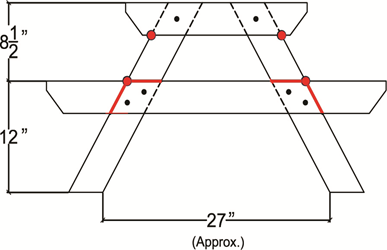 Repeat on the other side to create a 2x4x21 ½" trapezoid. Repeat on the other 2x4x21 ½" piece. Take the  2x4x25 ⅝" pieces cut in Prep Steps 5 and 6. Measure and cut a 30° angle from each side to create  2x4x25 ⅝" parallelograms. Take the  2x4x17 ¾" pieces cut in Prep Step 7. Measure 2 ¾" in from the top left corner and draw a line from there to the bottom left corner. Set your miter saw to 38° and cut along this line. Next, measure and make two marks: 1" in from the right bottom corner; and 1 ⅛" up from the bottom right corner. Connect these lines to create a guide and cut along this line, with your miter saw still set to 38°. Finally, measure 3" to the left from the top right corner, and draw a line connecting it to the point on the right-hand side that you just cut (approx. ⅜" down). Set your saw to 52° and cut along this line. Repeat on the other 2x4x17 ¾" piece to create  2x4x17 ¾" polygons. Locate the pieces for the A frame. The A frame consists of:  legs (2X4X25 ⅝" parallelograms),  table support (2X4X21 ½" trapezoid) , and  seat support (2X4X 40 ¼" trapezoid). On the legs, measure 4" down from the angled edge of the parallelogram and mark with a straight line as indicated by the top red dot in the picture (do this for all legs). From the 4" line, measure down 5 ¾" and mark with a straight line once again (do this for all legs). For the table supports, make a mark on the bottom side of the trapezoid 3" from the ends (do this for all table supports). On the seat supports, make a mark 9 ½" in from the ends on the upper side of the trapezoid, and 7 ½" in on the bottom side. Join the 2 marks with a line. 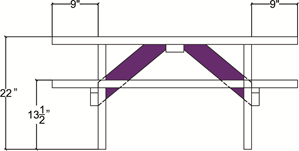 Assemble the A frame by aligning the table support and seat supports along the lines you drew on the legs (see diagram). The tops of the legs should be flush with the top of the table support. Attach each intersection with 2 screws and then drill pilot holes for each of the carriage bolts as shown by the black dots in the diagram. Attach carriage bolts. The head of the carriage bolt should enter through the side of the seat and table supports and then through a washer and nut on the inside. Be sure to stagger the bolts as show by the black dots. Stand up the 2 A frame sides, making sure the carriage bolt heads are towards the outside and the nuts are towards the inside. Locate the pieces for the table tops and seats - the  2X6X48" pieces and the  2X4X48" pieces. Take both of the 2x6x48" pieces and  of the 2x4x48" pieces. For each of the pieces, measure 9" down from the upper right end and mark with a straight line (see diagram). Using the marked table top pieces (2X6X48) and outer seat pieces (2X4X48), connect the two frames as shown in the bottom left diagram. Screw the seat and table top boards to each leg frame. NOTE: Be sure the seat and table tops extend ¼" past the edges of the A frames as shown in the bottom diagram. Attach the seat and table top board with the grain oriented as shown. Lumber tends to warp AWAY from the center of the tree: this orientation will ensure the wood cups down if it warps. Locate the center support (2X4X19 ½"). 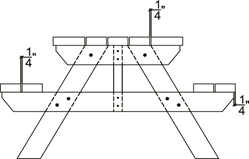 Place the support to the center of the table halfway between the A frames. Attach the support by screwing down through the table top boards. Locate the diagonal braces (2X4X17 ¾"). Install the braces from the center support down to the legs. NOTE: The braces will need to be offset at the top in order to screw the center table top support into both braces. Be sure to plumb the A frames as you install the braces so that everything fists tight and flush. Install the braces with 2 screws at both ends. Attach the rest of the table tops and seats leaving a ¼" in gap between each board, or an even distance. Be sure to pre drill to avoid splitting the wood.